We're hiring! Check out our open positions here. The Centers for Medicare and Medicaid Services (CMS) has released its final rule with comment period for the Medicare Access and CHIP Reauthorization Act of 2015 (MACRA). The details are final for the first performance year, which begins January 1, 2017 and impacts payments beginning in calendar year (CY) 2019. However, there will still be a comment period available as CMS seeks information from clinical practices to determine if future adjustments to the program are needed. The difference between what was proposed and this final rule reflects some monumental movement on the part of CMS. Although there are more details to comb through in the 2,204-page document, I wanted to share with you some of the highlights of what has changed between the proposed and final rule, as well as some early insight into the changes and how CareSync™ can help you move forward with MACRA in the years to come. There has been a reduction in the number of measures required for reporting through the Merit-Based Incentive Payment System (MIPS). The following indicates how the four performance categories are now broken down. The Quality category was initially proposed to count for 50 percent of the MIPS score, but will count for 60 percent in CY 2017. Depending on how much the clinician wants to participate, they can report on as few as one quality measure for partial credit, or on six measures or one speciality-specific set for full credit if submitting quality data as an individual physician. To receive full credit in the Improvement Activities category, the initial proposal required completing six medium-weighted or three high-weighted activities, but the final rule requires completing four medium-weighted or two high-weighted activities. For small practices, rural practices, or practices located in geographic health professional shortage areas (HPSAs), and non-patient facing MIPS eligible clinicians, CMS reduces the requirement for this category to only two medium-weighted activities or one high-weighted activity. CMS also indicated that because improving care often involves deploying EHR technology, there will be some improvement activities CMS will designate as also qualifying for the Advancing Care Information score. There is a significant reduction in the number of measures required for full participation in the Advancing Care Information category. There were 11 required measures in the initial proposal, but only five required measures in the final rule. Reporting on other measures is optional. A clinician reporting on all five of the required measures will earn 50 percent. Reporting on the optional measures would allow a clinician to earn a higher score. MIPS-eligible clinicians who choose to report nothing in 2017 will receive the full negative 4 percent adjustment. For CY 2017, the Cost category will not be counted in the performance score. It was initially proposed to be 10 percent of the score, but that 10 percent calculation was added to the Quality category for year one instead. Beginning with performance year 2018, the Cost performance category’s contribution to the final score will gradually increase from 0 to 30 percent by the third MIPS payment year of 2021, as required by MACRA, and the Quality category weight will decrease from 60 percent to 30 percent at the same time and by the same increments. CMS is calling CY 2017 a transitional year and envisions CY 2018 to also be transitional in nature to provide a ramp-up of the program, performance thresholds, and standards. To begin the transition, CMS is allowing clinicians to pick their pace for reporting through MIPS during the first performance year. Report under MIPS for a full 90-day period or, ideally, the full year. This will maximize chances to qualify for a positive payment adjustment and the possibility to earn a bonus for “exceptional performance” (available for years 2019 through 2024, with $500 million allotted annually for this purpose). Clinicians could start collecting performance data January 1, 2017, but if they are not ready and plan to participate for at least part of the year, they can choose to start any time between January 1 and October 2, 2017. Whenever they choose to start, they will need to send in their performance data by March 31, 2018. Report under MIPS for less than the full year, but for at least a full 90-day period, and report more than one quality measure, more than one improvement activity, or more than the required measures under the Advancing Care Information category in order avoid a negative MIPS payment adjustment and possibly receive a positive MIPS payment adjustment. Report one quality measure, one improvement activity, or report the required measures of the Advancing Care Information category and avoid a negative MIPS payment adjustment. Participate in an Advanced Alternative Payment Model (APM) and possibly qualify for a 5 percent bonus incentive payment in 2019. Alternatively, MIPS-eligible clinicians who choose to report nothing in 2017 will receive the full negative 4 percent adjustment. Over the past several months, we’ve heard a lot of concern over how the MIPS performance threshold (the benchmark or average expectation of performance against which physicians will be compared) would be determined and if it would be difficult to measure up to it. For CY 2017, the MIPS performance threshold is lowered to 3 points. There are still options for reporting as an individual MIPS eligible clinician or as a group. It is now estimated that between 592,000 and 642,000 eligible clinicians will participate in MIPS in 2017. A new low-volume threshold has been set. Clinicians who see less than or equal to 100 Medicare patients or accrue less than or equal to $30,000 in Medicare Part B allowed charges will be exempt from MIPS in 2017. According to CMS, this represents 32.5 percent of pre-exclusion Medicare clinicians (over 380,000 clinicians), but only five percent Medicare Part B spending. Although this will not be part of the implementation in 2017, MACRA provides for solo and small practices (with no more than 10 clinicians) to join “virtual groups” and combine their MIPS reporting. CMS is looking to stakeholders for suggestions on how to structure and implement virtual groups in future years of the program. The following are excluded from participating in MIPS: newly Medicare-enrolled MIPS eligible clinicians, Qualifying APM Participants (QPs), certain Partial Qualifying APM Participants (Partial QPs), and clinicians that fall under the finalized low-volume threshold. The difference between what was proposed and this final rule reflects some monumental movement on the part of CMS. I am deeply impressed that they have found a way to address a great many concerns, while still sticking to the original, patient-focused objectives this legislation is trying to accomplish. I’m also encouraged by the proactive approach CMS took in establishing this final rule with comment period. Beyond considering submitted comments, CMS actively pursued feedback from the clinical community and clearly took to heart concerns about participation in general, the fear that small practices would instantly suffer under the weight of MIPS, impacts on practice workflow, etc. Further, by continuing the comment period beyond the final rule, CMS has indicated a willingness to allow the industry to learn and adapt as it moves forward with the Quality Payment Program (QPP) and to take into account the feedback from those who will be on the frontlines implementing these changes in their day-to-day operations. It will be important to take advantage of this opportunity to help shape MACRA as it evolves. As we did when the pick your pace options were first announced in September, we encourage you to not leave revenue on the table. 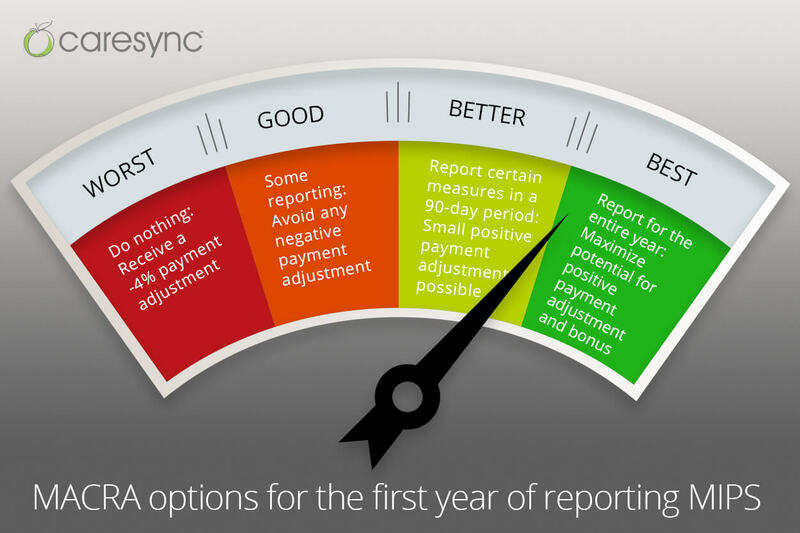 Ideally, report for the full year, but at least take advantage of the opportunity to qualify for a positive payment adjustment and the possibility to earn a performance bonus by reporting for a full 90-day period. If, for whatever reason, you plan to delay participation, we encourage you to make the most out of the time by looking into outsourcing Chronic Care Management (CCM) and care coordination services, and putting your systems and processes in place for generating quality data as early as possible. Make sure 2019 is the only year of positive payment adjustments that you miss out on. CareSync™ can help you move forward with MACRA in the years to come. If you are a client of CareSync with our full-service, turnkey Chronic Care Management program, we are already on the frontlines with you, supplying data on measures that can significantly impact your MIPS performance scores. But if you aren’t a client of CareSync, let us show you why you should be! As the nation’s leader in providing Chronic Care Management and other care coordination services to healthcare organizations, CareSync is uniquely prepared to help you achieve success with MACRA. We will dive deeper into the final rule in the next few weeks to identify the specific ways we can help support Advanced APMs, and will share those as soon as we have them—please check our website for updates. In the meantime, if you have any questions regarding the connection between care coordination, MACRA, and how CareSync can help you succeed in meeting the first year reporting requirements, don’t hesitate to contact us. No matter how you plan to participate in 2017, CareSync can help you meet the reporting requirements. Let us explain how our full-service turnkey Chronic Care Management program and other care coordination services can add monthly revenue and help you maximize value-based reimbursements.